Now that you have your braces, how do you live with them? It's important to properly take care of your braces throughout treatment to avoid decalcification stains on your teeth, swollen gums, and prolonged treatment. When you first get your braces, you may notice that your teeth and mouth feel a little tender or sore, especially with pressure from chewing. This is perfectly normal and we promise your mouth will not be sore forever! For tooth pain, stick to a soft diet and take a pain reliever such as Tylenol every six hours. Your lips, cheeks, and tongue may become irritated for one to two weeks as they become accustomed to the surface of the braces. 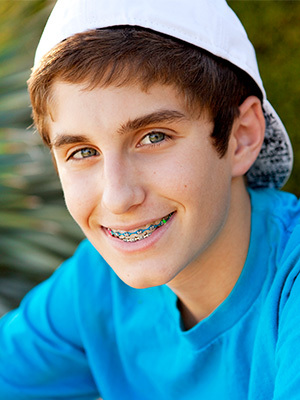 You can put a small amount of wax on the braces to lessen this...we'll show you how! You can also use any mouth sore gel such as Orajel or Orabase for temporary relief. If your teeth begin feeling a little loose, don't worry...this is normal! Your braces must first loosen your teeth slightly to move them into the right position. Once your teeth have been moved into the correct position, they will stabilize and no longer be loose. The wires and even the braces themselves may become loose during your treatment -- this is usually caused by eating foods that are harder than the braces can withstand. If this happens, it is not an "emergency" unless it is causing discomfort, but please contact us as soon as possible so that we can repair the braces or wire. If one of your braces comes off completely, be sure to save it and bring it with you to your appointment. You can temporarily fix the long wire by clipping it with fingernail clippers or any kind of wire cutter. If the loose wire is causing irritation to your lips or cheeks and you are unable to clip it, put a small amount of wax over the poking wire until we can see you in the office. We have great news for athletes -- you can still play sports with your braces on! If you do play any type of contact sports, we recommended that you wear a mouthguard to protect your teeth and braces. You can purchase one in our office or at any athletic store, but be sure not to boil it and mold it to your teeth -- this will make it too difficult to remove, and it may fit one day but not the next...your teeth are constantly on the move! In case of any hit to your mouth, be sure to check your mouth and braces for any damage. If you notice any loose teeth or braces, please contact our office immediately. You can temporarily relieve the discomfort by applying wax or rinsing your mouth with warm salt water. Damaged appliances can increase the length of your treatment and cause unwanted tooth movement, so be sure to follow the instructions listed above. In addition, optimal results and timely completion of your treatment can only happen with consistent wear of your orthodontic elastics (as prescribed by Dr. Wing).